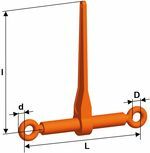 This load binder for one-part lashing chains in accordance with EN 12195‑3 is also suitable for frictional lashing, depending on the selected lever length (always take the STF value into account!). It has a 25 % higher lashing capacity than grade 8 and is manufactured according to EN 12195‑3. Please note that the product must not be used for the lifting or attaching of loads. A full operating manual describes areas of application as well as the assembly process. Assembly into a lashing chain is simple and quick thanks to Connex connecting links.